TrainingPeaks Garmin IQ App - Coached Workouts! Get your daily specific VELA Society coached and tailored TrainingPeaks workouts right on your compatible Garmin device and let it guide you through your workout in real time. Use indoors in ERG mode trainer, or outside providing step-by-step directions. Once downloaded to your device, they can be used immediately and it can be sourced anytime in "Workouts" folder for use later. Requires Garmin IQ App installation and Garmin Connect in Mobile device with active sync. Wealth of information is provided in the TrainingPeaks Help Center on Connect IQ App. There is nothing more satisfying than a workout that has been performed to perfection. 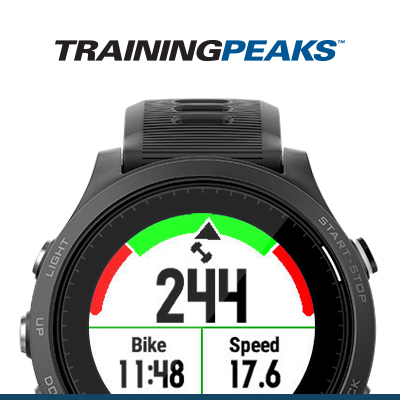 With the TrainingPeaks Connect IQ app, you can complete your daily structured workouts right on your compatible Garmin device. Load compatible workouts built using the TrainingPeaks Workout Builder and complete them in real time through your device, using Heart Rate, Power, or Pace targets.